These sets are perfect starters for making paellas and includes the paella burner, the paella pan, and the supporting legs. Imported from Spain and made from carbon steel, the pans are the ones most common and popular paella pan in Spain and is perfect for making authentic and delicious paella. They are shallow with sloping sides that help cook the rice evenly and developing more intense flavors. The pan is thin but quite rigid and durable with a hammered dimpled bottom which distributes heat evenly and quickly while also giving it a beautiful look. The handles are made of steel and painted red. The legs, also painted red give great support to the burner and pan. NOTE: Does not include regulator or hose. 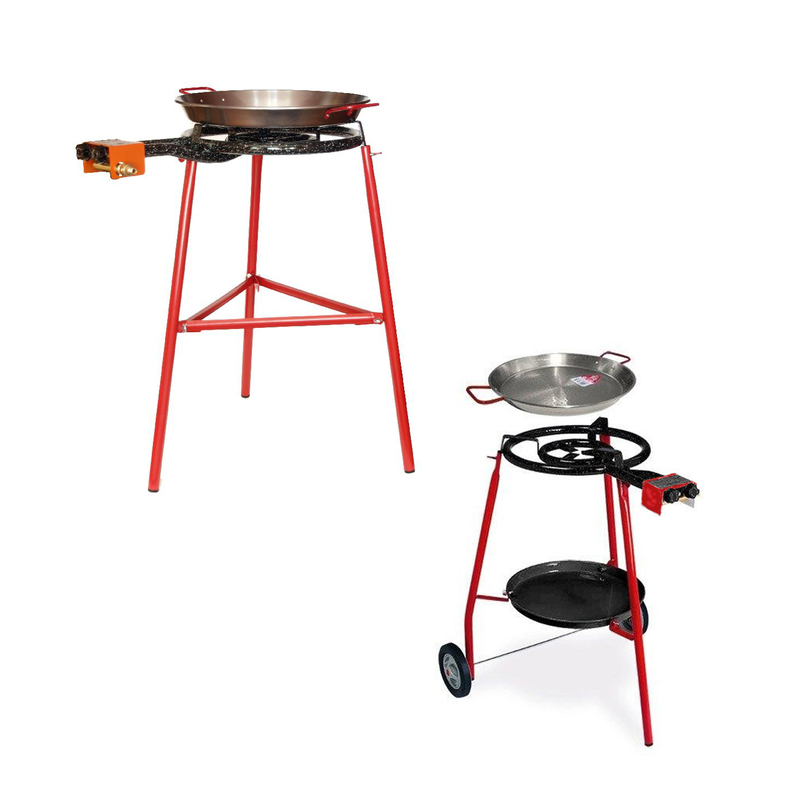 The Burners that come with these sets use propane gas and can be connected with appropriate hoses and regulators to the same propane tanks used for backyard barbecues. As with all propane burners and barbecues, it is extremely important to think about safety first before using the burner. To use the Paella Burner, assemble the burner and legs. Place the burner on a flat floor. If the burner has wheels on the legs, put rocks or blocks of wood under the front and rear of the tires to prevent slipping. Place the propane tank next to the burner and turn the nozzle to the right to verify it is closed. First attach one end of the burner hose to the burner by screwing it in by turning to the right. Then attach the other end of the hose to the tank. Make sure the hose attachments are tight and secure. Remember that the handles of the pan will get hot during use so always use care when handling or use protective gloves. The pans that comes with these sets are Carbon Steel Paella Pan, it should be cured and seasoned (please see the curing tab). Just like carbon steel wok, a Carbon Steel Paella pan will acquire a natural patina over time as they become seasoned and will absorb more flavors the more you use it. Just like woks however, if not taken care of properly, THEY WILL RUST. Never leave the pan to air dry without oiling it.